Gunmen Kill 2 Israeli Officers At Religious Site In Jerusalem : The Two-Way Three Israeli Arab attackers killed two border police officers before being shot and killed in a gun battle at Temple Mount. 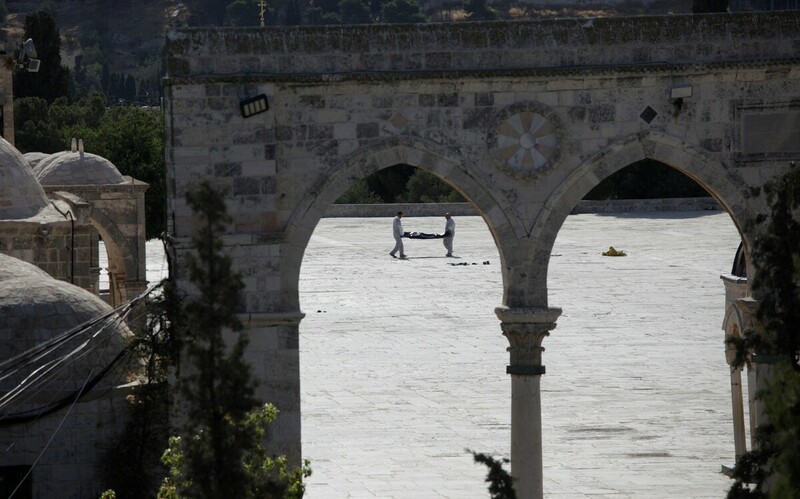 Israeli security forces carry the body of a man who police say carried out an attack at the site of Temple Mount and al-Aqsa Mosque in Jerusalem. Three Israeli Arab gunmen opened fire Friday near a religious site in Jerusalem's Old City, killing two police officers before being shot and killed by Israeli forces. The attack targeted a historic site on a hilltop that's revered by Muslims, Jews and Christians. Jews know it as the Temple Mount, and for Muslims it's known as the Noble Sanctuary. As NPR's Daniel Estrin reports, "This was a very rare shooting at the religious site that's at the core of the Israeli-Palestinian conflict." The attackers ranged in age from 19 to 29. They were from an Arab village in Israel's north and none of them had any record of security offenses, Haaretz reports, citing the Shin Bet security services. The slain officers have been identified by Israeli police as Kamil Shnaan, 22, and Ha'il Satawi, 30. Both were officers in the border police unit, and Satawi is survived by his wife and their 3-week-old son, police say. The attack sparked an intense gunfight at the ancient site, parts of which were captured on cellphone video. Earlier in the day, the gunmen had also posted photos of themselves at the complex to social media. Israeli police have canceled Muslim Friday prayers at al-Aqsa Mosque, in a rare move that's causing some controversy. After the Grand Mufti of Jerusalem Muhammad Hussein was prevented from entering the complex, he called on Muslims to gather at the barricades, according to Ynet News. "There isn't a force on earth that would prevent them from getting to al-Aqsa and holding Friday prayers," he said. 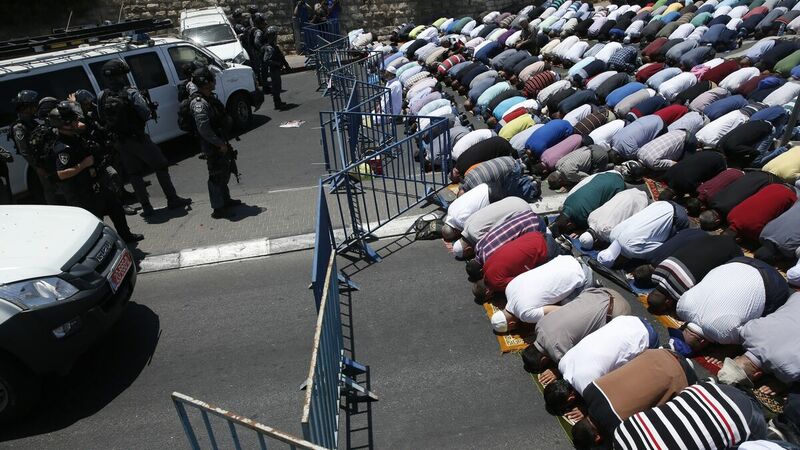 Muslim worshippers perform the traditional Friday prayers on a street outside the Lions' Gate as Israeli police blocks the access to al-Aqsa Mosque in eastern Jerusalem. Saying that the closing could increase tensions in Jerusalem, Haaretz reports that the last time the complex was closed for Friday prayers may have been in 1990. "The Islamist group Hamas praised the shooting," Daniel reports for our Newscast unit. "Nationalist Israeli lawmakers called for extending visiting hours for Jews at the Muslim-administered site." As The Los Angeles Times reports, "Violent clashes on the Temple Mount have been the spark for prolonged and deadly waves of Israeli-Palestinian violence in the past." The site is where Muslims believe "the Prophet Muhammad ascended to the 'Divine Presence' on the back of a winged horse — the Miraculous Night Journey, commemorated by one of Islam's architectural triumphs, the Dome of the Rock shrine," according to the Smithsonian.